Rakhi Purnima is on Thursday 18th August 2016. Raksha Bandhan is a Hindu festival. Rakhi Purnima is celebrated on the Shravan Poornima (Full Moon) day in the month of August every year. Raksha Bandhan is an sacred bond between a brother and sister. The festival is also observed by Jains and many Sikhs. Rakhi Purnima occurs in Sravana Masam. Rakhi Purnima is also known as Raksha Bandhan. On the auspicious day of Raksha Bandhan sisters get up early, have a bath and then pray to Lord Ganesha. Then sister apply Kumkum tilak to brother forehead, and tie a Rakhi on his wrist. then perform the aarti of brothers. Following which sweets and gifts are exchanged and there is happiness all around. This symbolizes the sister's love and prayers for her brother's well-being, and the brother's lifelong vow to protect her. As the brothers include cousin brothers also. Raksha Bandhan is an ancient festival, and has many myths and historic legends linked to it. In the epic Mahabharat, Draupadi tied a Rakhi to Krishna. Lord Krishna said the importance of Rakhi Purnima to Yudister. Goddess Gayatri devi has sacred thread as a symbol. 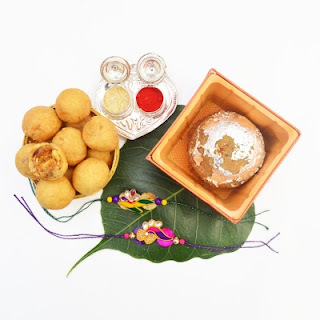 Rakhi festival is called Narial Purnima in Maharastra because they knock coconut to ocean for bounty. Keralean people called the occasion as the avani avittam. Raksha Bandhan which is celebrated all over India and all over world.